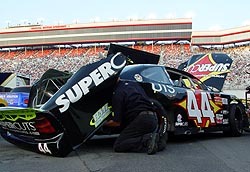 Clay Rogers said before the race at Bristol that Shane Huffman could have the Southern Division season title as long as Rogers could win at Bristol, exact opposite of the two drivers did last season when Huffman won Bristol and Rogers won the Southern title. They can crown Huffman the Southern Division champion now, because on Wednesday night, Rogers took the win at Bristol Motor Speedway in the Food City 150. It wasn’t the only time the lead would change hands amongst a number of drivers. It also wasn’t the only time several big names would be sent spinning and crashing. It also set the tone for what would be a wild, bang-them-up night. Rogers took the lead from Jeff Agnew late in the race and survived caution after caution and wreck after wreck for his first victory of the season. “When you look at the faces of your crew, you know how much this place means to you,” said Rogers. “I was excited when I climbed out of the car. It was nice to look over at those guys and see them smiling. We are not a multi-million dollar race team. We are just three or four guys. We haven’t had a lot of luck this year. Six days ago, this car was a chassis and a body. However, the win didn’t come easy for Rogers. Just like the race wasn’t easy for most drivers. The tone of the night was set just five laps into the event. Rogers, who started on the outside pole, got the jump on pole sitter Shane Wallace at the start. 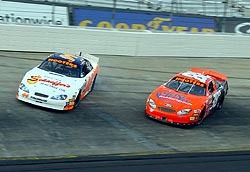 Wallace, however, began catching Rogers and looked to make a move going into turn one on lap five. The two drivers touched, both went spinning (both keeping their cars out of the wall), and it handed the lead over to Bobby Gill. Rogers came in to pit, along with the rest of the leaders, following his spin. Rogers was then penalized for dropping down too soon and had to start at the back of the pack. That might have been a big blessing in disguise to him. As the rest of the leaders came out of the pits in mid-pack, the field went back to green. Just a couple of laps into the green flag run, contact between Steve Wallace and Joel Kauffman triggered a multi-car wreck that turned Kauffman around in front of most of the oncoming traffic, including all of the leaders who were running to get back toward the front of the field. Things started out bad for Rogers (#44), who spun with Shane Wallace (#38) while battling for the lead just five laps in. some out for the night, while at least causing various amounts of damage to all those cars involved, and likely others as well. Some of the big names involved in the accident included Mark McFarland, Shane Huffman, Bobby Gill, Andrew Rogers, Shane Wallace, Ken Butler, Daniel Johnson and Danny O’Quinn. McFarland, Huffman and Butler were all able to continue and stay on the lead lap after fixing their damage, while Rogers, Gill, O’Quinn and Wallace all retired from the event or came back later, several laps down. While all of the accidents, beating and banging was going on, Michael Faulk, Kertus Davis, Stacey Puryear and Jason Sarvis all spent time at the front of the field. Behind them though, there was still plenty of action. The most serious incident of the night came on lap 53, when two separate wrecks on the same lap took out two different cars. John Sarppraicone got into the wall on the front stretch, while at the same time, George Brunnhoelzl III, who was running fourth at the time, got into the wall coming into turn three. But there were some who stayed out of trouble, including Northern Divisin invader Jeff Agnew. Agnew battled with Rogers for the top spot late in the event. Agnew got around Rogers when Huffman, who was a lap down, got into Rogers trying to get back on the lead lap. Huffman shoved Rogers high coming off turn four and the contact enabled Agnew to take the lead on Lap 125. While Sarppraicone’s incident was minor enough, even though it knocked him out of the event, Brunnhoelzl’s was not. Over the radio, Brunnhoelzl thought the tire blew on his #20 machine, sending him straight into the wall entering turn three. When the car came to a rest, Brunnhoelzl told his crew the wind was knocked out of him and the hit hurt. He got out of the car and walked to the infield car center, but was later placed on a backboard and transported to a local hospital for more tests. Thankfully, Brunnhoelzl was released late on Wednesday night. During Brunnhoelzl’s accident, a piece of debris, thought to be from his car, flew some 35 rows up into the stands in turn three, hitting a couple spectators. The spectators were worked on in the stands, and eventually taken to the hospital. Later in the evening, the track announced the spectators had been treated and released for their injuries as well. Jay Fogleman, Kirk Leone, Brandon Collins and Michael Ritch were others who experienced incidents the rest of the night. The lack of patience was summed up by Steve Wallace, who was involved in a couple of skirmishes, at the end of the night. The infield looked like a junkyard after the event, with George Brunnhoelzl III (#20, above) and Joel Kauffman being two of the drivers that left the track with wrecked racecars. It was short lived for Agnew though, as Rogers passed him back for the lead on lap 137 for the final time. 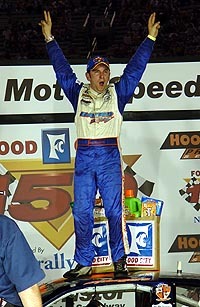 Then, Rogers had to hold off a green-white-checkered finish to collect the win. “It was just good timing. I think he got into the corner a little low and he washed up the track and we were able to get a run on him and get by him. 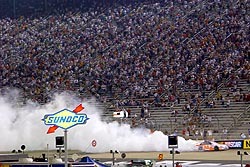 Rogers' burnout was a treat for all the fans in attendance. 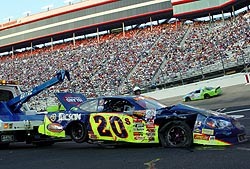 McFarland came back from being involved in the early race melee to finish third, just as the engine of his machine expired crossing the finish line. Billy Bigley and Jason Sarvis rounded out the top five finishers. Speed 51 will have much more on the event with post race comments from man of those involved later in leftovers.